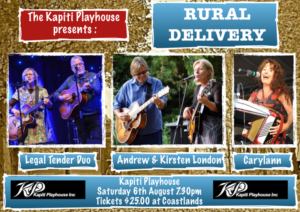 Rural Delivery at Kapiti Playhouse - Cancelled - Kapiti Playhouse Inc. IMPORTANT: Unfortunately due to low ticket sales this concert has been cancelled. We apologise to all those who had already purchased tickets. Rural Delivery brings a show of two halves to the Kapiti Playhouse on Saturday 6th August. Five of the country’s busiest entertainers combine to present a night of toe-tapping country music and mischievous musical comedy that’s as keen and Kiwiana as anything you’ve had delivered through your letter box. The Legal Tender Duo of Ian Campbell and Moira Howard have been performing an eclectic mix of country covers and originals around New Zealand for more years than they or anyone else care to remember. Sensitive guitar/bass arrangements of songs by Guy Clarke, Hank Williams, Gillian Welch and Alison Krauss are rendered with earthy integrity and exhilarating vocal harmonies. Frequent collaborators with various members of the Hamilton County Bluegrass Band, their blend of alternative country and down-home original songs have delighted audiences from the Bay of Islands to The Deep South and recently netted them no less than four ‘firsts’ at the Gold Guitar Awards in Gore. Carylann Martin contributes keyboard and accordion along with a sublime voice that will have the hair on the back of your neck stand up and applaud. A well-loved regular on the country music scene, her latest collaborations have been with duo Rusty and Rose and Kapiti four-piece social commentators Henpicked. Andrew London’s quirky and satirical songs were the mainstay of popular swing trio Hot Club Sandwich before he stepped out under his own name in 2012 with partner Kirsten on bass. Both groups have provided him with a vehicle for mischievous musings on concrete block motels, pretentious socialites, society weddings, road rage and youth culture; and contributed to feature films (Second Hand Wedding, No Petrol No Diesel), a year 13 English syllabus and National Radio’s ‘Best Song Ever Written’. 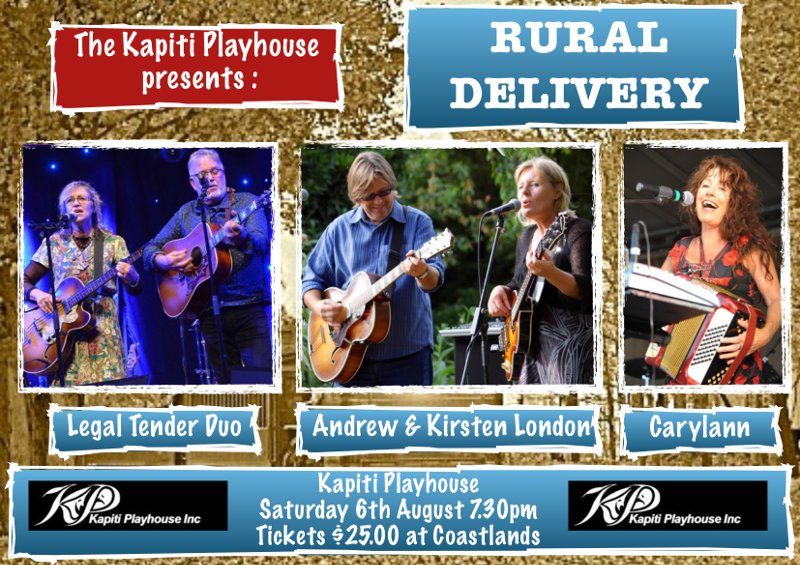 Rural Delivery combines old-time country with new folk stylings and satirical Kiwiana and is on at Kapiti Playhouse’s Theatre Saturday 6th August at 7.30pm. Tickets are only $25 and can be purchased at Coastlands or via the TicketDirect website. If you would like more info, you can contact Andrew London at london [at] paradise [dot] net [dot] nz or 021-496-766 and you can also visit his website at www.andrewlondon.co.nz.